Below is a newsletter written by my friend Kath, who has gone out primarily to do an evaluation of what we do but also to teach English to the staff. No doubt there is plenty more she has been dragged into! Thank you to Kath, and to all the volunteers who contribute so much to the project. When you step off the plane in Kigali, you smell woodsmoke. I read once that this is the smell of Africa. In the evening, when I have my windows open in the volunteer accommodation in the Meg Foundation, the smell of woodsmoke drifts through. 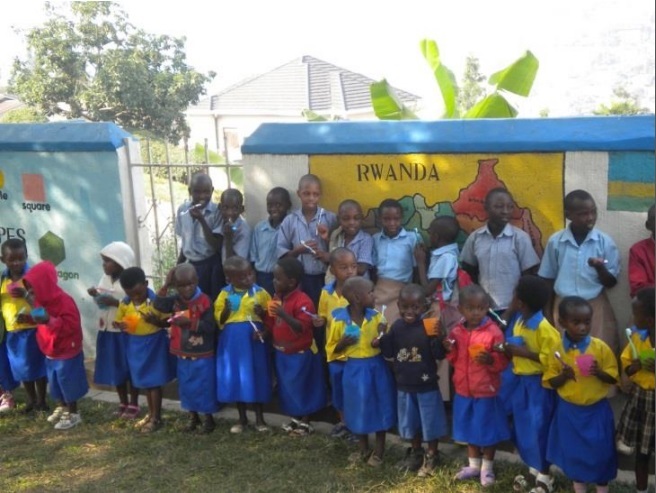 Having spent over a year planning to come to Rwanda to volunteer at the Meg Foundation, it was very exciting to arrive at the beginning of June. I was relieved to be met at the airport -by John, who has been volunteering here for several months, and Daniella, a friend of the project – not least because I was carrying a heavy bag full of necessities such as exercise books and jumpers for the children, and gifts from sponsors. The welcome I have received from the children and staff who come here every day has been overwhelming and humbling. 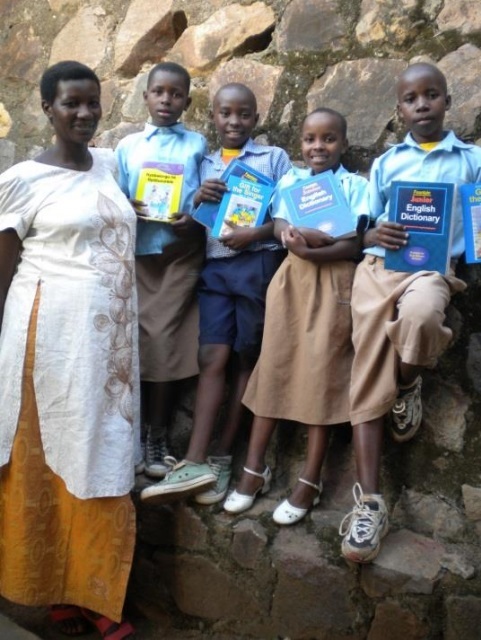 Meg has written elsewhere of the enthusiasm and joy of the children who come here to learn and who are enabled to learn because of the feeding programme. It has been a busy two weeks. 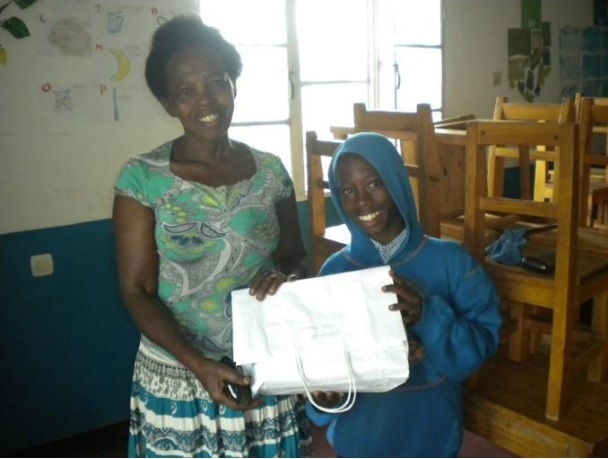 Those children who are fortunate enough to receive sponsorship are hugely appreciative, not only of the extra treats they receive, but of the long term difference it makes to their life chances. John’s parents in law were visiting Rwanda and wanted to see the children practice their dancing, which they do on a Saturday morning. Eric and the children were insistent that they put on a special performance, which was excellent and enjoyed by all. Last Monday, it was Bella’s birthday. We had a special celebration for her. 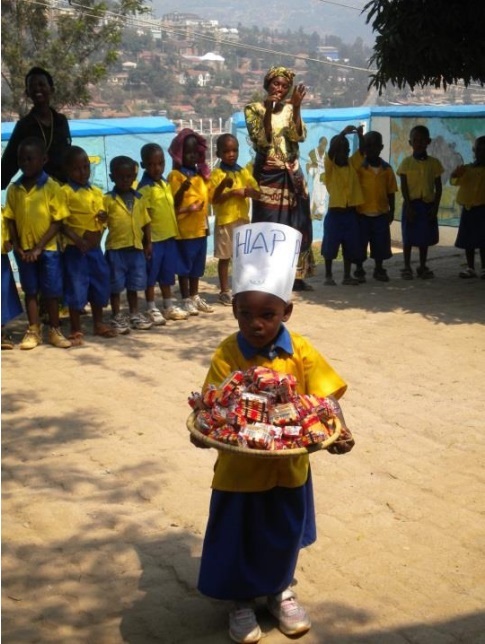 Her mum came, everyone was given a small packet of biscuits, and I think she enjoyed wearing her special hat! On Tuesday, Epiphanie took 4 children to a reception hosted by the Ministry of Education to receive their prizes for reading and writing. They arrived back proudly clutching their prizes. 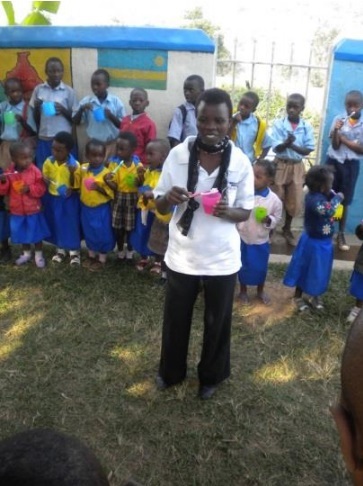 Over the last 2 weeks, the school has been running a personal hygiene campaign with all the children. This coincided with a general district campaign and the arrival of sufficient children’s toothbrushes in my suitcase. Learning how to clean your teeth in the open air, and being the proud possessor of a brand new toothbrush is exciting. All these extra special events are additional to the day to day teaching and caring for the children which goes on. The community projects continue. Basket making takes place every afternoon under the tree in front of the school. We are about to send a consignment of baskets off to the US which will provide a little income for all concerned. The sewing room is busy, bags aprons and beads are for sale there. 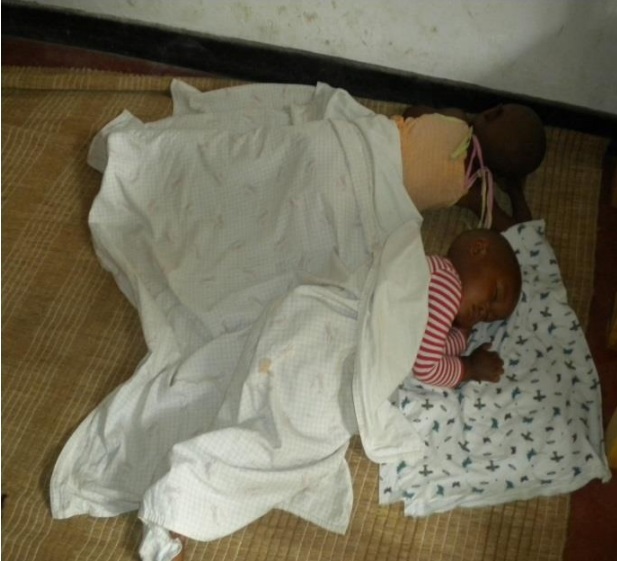 Adult Literacy classes continue too, although it is sometimes all too much for the students’ children. I am looking forward to the next seven weeks I will be spending here and wondering what they will bring. We have a Summer School planned for August, and the English Club for teaching staff will continue on Saturday mornings and into the first week of the school holidays. More of all of that in a later newsletter.